I ’ve been listening to a lot of Elvis lately. The all Elvis satellite radio station blares in my car most mornings, much to Julia’s dismay. 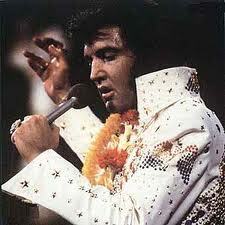 After dropping her off I often indulge more in Elvis the religion, the god. I get pumped listening to Suspicious Minds, I listen to the testimonials of people touched by The King, whether a lei or a lay, that play in between medly’s, live performances from Vegas, and interviews with this soft-spoken, sweet humble sounding man with a cute, giggly laugh. Sure, he’s a little before my time. When I was growing up he started growing into that big white rhinestone studded jumpsuit on his ever-expanding pelvis. Except for that 1968 special when he wore that black leather outfit. http://www.allmusic.com/album/nbc-tv-special-68-comeback-mw0000654106. I remember that jumpsuit to this day because he looked so damn hot. But I feel like need to pay tribute to The King, to make up for lost time. Especially now that getting ready for work each morning feels more and more like I’m slipping into my own too tight jumpsuit and cape. But since I never made a get to, I am not exactly sure how to make a come back. Watching the Grammy’s tonight, or should I say the #Grammy’s, I’m searching for Paul and Ringo in the audience and wondering who those two old dudes with the dyed hair are, while listening to Robin Thicke and Chicago play Blurred Lines. My daughter doesn’t know who Chicago is, and I don’t understand how this Robin Thicke guy made it so far that he can play Saturday in the Park with the guys who colored my world only yesterday. I remember when JT meant James Taylor for goodness sake. How did everyone I love so much get so old? And oh, that means I too am aging. Please don’t get me wrong. I believe pop music has reached a magnificent peak of talent and creativity that breaks so many boundaries. Imagine Dragons are one of my new faves, and how cute is Adam Levine, no matter how much acne he had as a kid? As a matter of fact, if I was growing up now instead of then I would have a way cooler variety of female singers to lip synch to in front of my bedroom mirror with my hairbrush. Although back then I pretended to be Donna Summer, or Carly Simon or half of Captain and Tenille, how freaking cool would it be to pretend to be Rihanna or Katie Perry, or even Lady Gaga with meat hanging all over her body? Growing up I waited weeks for the Grammy’s. It was the epitome and culmination of all the people I loved most in the world all gathered together. Sitting together, hanging out, hugging. How many awards would Stevie pick up? Who would come dressed in something weird? How late could I stay up and see the whole thing? Pop music connects us, old and young. Maybe my daughter doesn’t appreciate the Rolling Stones yet. But she loves Jon Bon Jovi and sings at the top of her lungs to Carry On by Kansas. We are slowly working backwards. She tolerates some Beatles songs, though I think she really does like Hey Jude. At least it gets a conversation going. Just like fathers and sons use sports to connect, Jules and I use music. 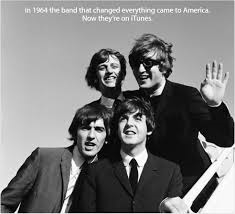 The Beatles are 50 and so am I. 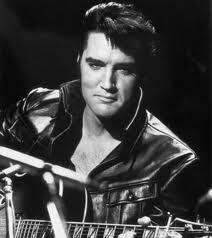 And Elvis is long gone but not anywhere close to forgotten. And as I sit here listening to Paul sing with Ringo on drums the sensation returns, it feels okay to float away to that place again, and grab my hairbrush. And I don’t care who walks in. This entry was posted in Music and tagged Adam Levine, Beatles, Chicago, donna summer, elvis, elvis presley, grammy awards, grammy's, Hey Jude, James Taylor, jon bon jovi, journey, JT, Justin Timberlake, kansas, lorde, paul mccartney, pop music, ringo starr, Robin Thicke, the king by pattytmitchell. Bookmark the permalink. that’s very interesting topic, I didn’t even imagine where it would lead me to think. Well, I like music or I love music, too open to try something new and taste different music especially that i’m into new cultures. Even though, I still have special bands and singers; Creed for example is my favorite rock band ever, I have also Johnny Cash, he’s inspiring. I like pop music, Rihanna, Lady Gaga. The good thing about music is that it lives with you and accompanies you along the way toward your goals. How many times did music bring back the same exact feelings you had ages ago? that includes the fact that we’re growing older, all of us. I’d like to say that i’m enjoying growing old and so should you. My simple philosophy is that no one ever wants to be young forever, age has its wonders and mysteries, it has to be amazing. by the way, i’m pretty sure you know Demons by Imagine Dragons, it’s one of my favorite, really. Did you watch the movie, The Words? it’s the soundtrack of this movie. Thanks so much for your comments Ahmed. I love your outlook on the aging process. You’re right no one wants to stay young forever, but I’ll take a week or two! Take care and thanks again for dropping in!